By Mike Dovey & Roger Hosking. You may click the thumbnail images below to see the whole cover. Seapost is the term we give to the whole range of postmarks available to collectors of mail of maritime origin and can be split into the following areas. By its very nature a collector must be prepared to accept that any dates given are purely indicative as this hobby is an open journey to collect rather than just filling in the numbers in a catalogue. Ship Letter cancels were applied to mail coming into Great Britain and its Empire countries and are usually seen from 1760 until 1840 although these dates can vary a great deal, (Mauritius was still using their original mark into the 1970's). All mail from ships, allowed by the Post Office to carry such, was delivered to the first land-based post office encountered and this led to all sorts of cancels like Romney, Kingsbridge, Lancaster and Deal to name but a few. All of the GB cancels are dealt with in an excellent book "Robertson Revisited" by Colin Tabeart, published in 1997, with a Supplement published in 2011. 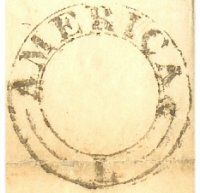 In 1840 a contract was issued by the GB Post Office to Samuel Cunard to carry mails across the Atlantic giving rise to a new series of packet postmarks such as the "America L" cancellation and related Liverpool packet letter marks. A wide variety of cancels from Liverpool were used on all mails carried from the USA to Great Britain including accountancy marks to show that the letter had come from abroad and that the correct postage had been levied before it was forwarded to the addressee. Again these marks, as well as similar from other cities such as London and Dublin, are all dealt with in both the above books. By 1891 the shipping lines from Europe were going all over the world and the passengers on board were having great difficulty in posting mail. A letter written on board ship could only be posted if when the ship arrived at a port, someone was sent ashore to purchase postage stamps, and then the letter was posted by the same person having to go ashore again to post. In 1892 the Universal Postal Union (UPU) decided at a meeting in Switzerland that all ships were their own sovereign territory while on the high seas and outside territorial waters and that a passenger could write a letter, add a stamp of the country the ship was registered in, and put the letter in the ship's mailbox. From there it was taken to the nearest post office in the next port of call and a "paquebot" postmark was added to the letter usually over the stamp. This practice is still in use today albeit on a much reduced scale owing to the predominance of air travel. The first time ships were to use this method was in 1894 and it was taken up at first by Britain and France and then it spread around the world as it was so much easier to use this new postal system. Letters dated pre 1900 are quite rare and are sought after. A complete A-Z of known paquebot marks are all shown in another excellent book "PAQUEBOT CANCELLATIONS OF THE WORLD 4th Edition" written by Mike Dovey & Keith Morris. In 1900 many of the shipping lines took on board the new rage sweeping society at the time - the picture postcard. By selling on board each vessel a postcard of the ship it not only allowed the passenger a way of communicating with families etc but it also allowed the company to advertise their shipping lines by showing just how attractive a particular ship was. Holland Amerika (Netherlands) was among the first, while P&O, Cunard (GB) and Hamburg Amerika (Germany) were to follow. These postcards were beautifully drawn and coloured and of course when posted received a good range of paquebot postmarks as they were posted from ports around the world. From the very late nineteenth century, certain countries with large merchant fleets began to install official post offices on some of their flagged ships. These were run, staffed and paid for by their respective governments. The leading exponents of this procedure were France and Germany, with the USA, New Zealand, Japan and Italy as runners-up. Postcards and envelopes posted from these ships can be highly sought after especially those from the USA, mainly due to the number of collectors from that country. (Great Britain had sea post offices on board ships crossing the North Atlantic, belonging to White Star Line). Look at our survey of German and American Sea Post Office marks. Do you have covers with marks not listed here, or on covers carried by different ships than these? References: "The Transatlantic Post Office" and "Seaposts of the USA" both by Roger Hosking. There are other maritime cancellations available including Naval MARITIME MAIL and the whole collecting area of "Seapost" is wide in total and deep in structure. Collecting any form of "Seapost" covers can lead the collector eventually into fresh pastures, with any first area of interest widening to cover just one more aspect of this truly amazing collecting area. Finally, we must mention the Birmingham Ship Letter mark issued to a landlocked city in the middle of England. Society members have been studying this mark and Ian Baker has produced a census of covers. See this page for more information.